Arab women have shown once again that women can often play important roles in revolutionary events. In Egypt and Tunisia they participated in the popular uprisings for democracy — and are continuing to press for progressive changes in their societies — just as they were active in labour strikes in recent years, in some cases even pressuring men to join the strikes. Women’s activism is not a recent development, notes Ms. Jemaa. “For Tunisian women, independence is not something that came with the revolution, it has been there.” Before national independence in 1955, Tunisian women faced severe discrimination. They were often taken out of school, forbidden to see male doctors and limited in the political sphere. Yet during this period Tunisian women developed an awareness of their deprivation and began fighting to advance their role in society. With independence, President Habib Bourguiba played a pivotal part in advancing the role of women. A “personal status code,” adopted in 1956, gave women rights that were unprecedented in the Middle East and the Muslim world. These included the right to vote and to be elected to parliament, to receive wages equal to those of men, to have access to mixed-gender education and to be granted divorces. In 1993 “honour crimes” — in which women were harmed, even killed, by family members for transgressing cultural norms — were criminalized. As a result, the women’s movement in Tunisia is relatively advanced compared to those in other Middle Eastern countries, notes Ms. Jemaa. This paved the way for Tunisian women’s visible involvement in the revolution that toppled President Zine el-Abidine Ben Ali on 14 January and forced him into exile in Saudi Arabia. After the ouster of the president, members of the previously banned Islamist Nahda Party returned to the country. The party will be allowed to take part in Tunisia’s elections, but that does not worry Ms. Jemaa. The revolution in Tunisia inspired people in neighbouring Egypt to take to the streets on 25 January to demand freedom and dignity. But even before the uprising, female factory workers had staged major strikes in 2007 in the city of Mahallah. When this year’s protests began in Cairo’s Tahrir Square, women accounted for 40 to 50 per cent of the demonstrators during the 18 days that led to the fall of President Hosni Mubarak. Women of all ages, with and without veils, set up barricades, led debates, shouted slogans and, together with the men, risked their lives. Weeks after Hosni Mubarak stepped down as president and power was transferred to the military, the youth movement continued to gather in Tahrir Square to protest the slow pace of reforms. Ms. Tarzi says there was a sense among protesters that the army had betrayed them. 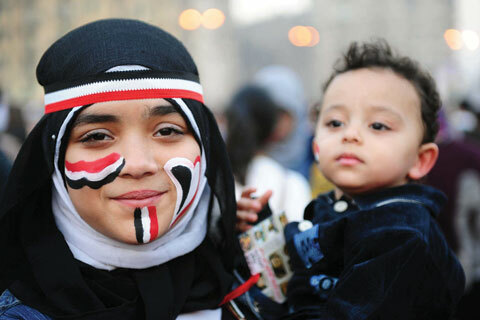 Ms. Tarzi, like other women, continues to protest against the injustices that prevail in post-Mubarak Egypt. Ms. Ramdani believes that religion, culture and law have all contributed to the state of affairs in Algeria today, with certain interpretations of religion posing particular problems for women. In post-revolution Tunisia, Ms. Ramdani adds, the voice of women is louder than in Algeria because it is a secular society, with a distinction between religion and the rule of law. She is very optimistic about the future, because women are finally speaking up. She notes that this is evident elsewhere in the Arab world, including in countries such as Saudi Arabia and Yemen. In Saudi Arabia, where women are banned from driving, several women drivers have posted videos online showing themselves defying the ban. “It was previously unthinkable that women there would defy the king by getting into their cars and driving,” comments Ms. Ramdani. “I am positive about the future for women in the Middle East,” she says. “The fear barrier has been broken. Fear was a major hindrance and it is gone forever.” The wind of revolt that is sweeping across the Arab countries has led people to realize that change is possible. Women in different parts of the region face different challenges. While some countries have accomplished more, it seems that what women across the Arab world want is for their voices to be heard. They want their basic human rights to be respected in societies that are free and fair for all. *This article has been published in cooperation with the United Nations publication Africa Renewal.